WASHINGTON, CIRCA DECEMBER 2011: Soy beans are harvested on a farm in Washington in December 2011. 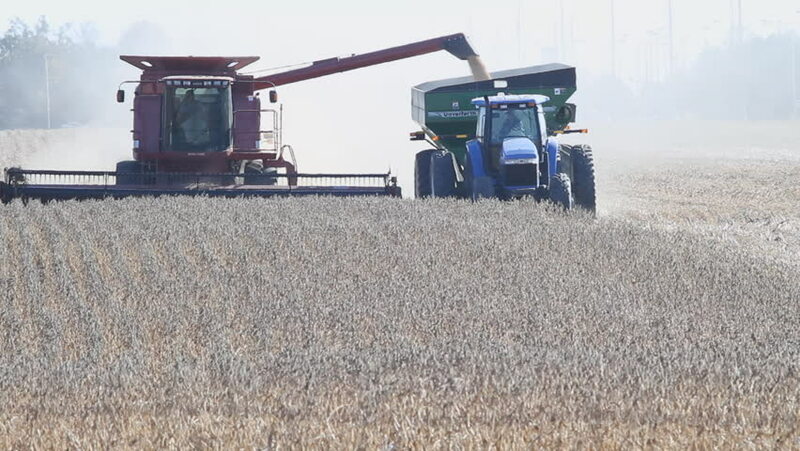 The U.S. Agriculture Department reported larger than expected soy bean inventories, forcing prices down. hd00:15WASHINGTON, CIRCA DECEMBER 2011: Soy beans are harvested on a farm in Washington in December 2011. The U.S. Agriculture Department reported larger than expected soy bean inventories, forcing prices down. hd00:06Bryansk, Bryansk Region, Russia. 08.20.2018: A bunch of onions in a tractor trailer of a combine harvester, Harvest Onions in a Field. Harvest onion with a combine harvester and a tractor in a field. 4k00:11 Dnepropetrovsk, Ukraine, July 18, 2016: Combine harvester working on sunny summer day. 4k00:24Kilkis, Greece - June 11, 2016: Aerial view of agriculture machinery, combines harvesting golden aged rye,wheat fields in the countryside on a cloudy summer day.